We currently have a special offer on theme and amusement park attractions. 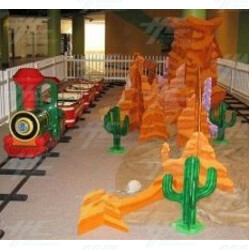 We have a customer selling an 'as new' Zamperla El Paso Train for $14,995 USD. The kiddy train comes standard with a train engine and can accommodate up to 14 children. Zamperla's line of small kiddy trains are economical, high grossing rides that are sure to entertain children of all ages. Please see this link for photographs. We also have a used remote control car and boat set on offer for $19,500 USD. The set is manufactured by Tornado in the UK and includes 8 cars and 8 boats with control stations. It also comes with spare kits, batteries and chargers. Tornado have designed, manufactured and supplied their products to the amusement industry since 1969. Their products are renowned for their quality and reliability. The 58cm remote controlled cars are ideal for both indoor our outdoor areas. They can be installed in an open track or a closed cabinet. Tornado offer a wide range of models and colors. Car bodies are interchangeable to allow for easy upgrade or a change of theme. The cars feature an instant steering response that creates a thrilling and exciting driver for any user. Each car has its own sound system that simulates the sound of a car engine. There is also an 'attract mode' feature can also be utilized to encourage passers by to play. The 80cm mini marina boats are also available in a variety of styles and colours to suit any location. All boats are fully controllable in both forward and reverse and feature twin propeller control. These boats are ideal for most types of pools, including existing water areas and purpose built vinyl or concrete pools. The boats have hard wearing, water resistant fibre glass hulls with coloured PVC tops. Both products are perfect for malls and amusement parks. For more information please contact our sales team.